Invigorate your senses and indulge with an aromatic cup of Big Train's Blended Ice Coffee! Made with pure Arabica coffee, with no hydrogenated oils or trans fats. Simple to prepare - just add water (or milk) & ice, blend, top with whipped cream, and enjoy a decadent coffee frapp�! Can also be prepared as a delicious cafe latte by just adding hot water! 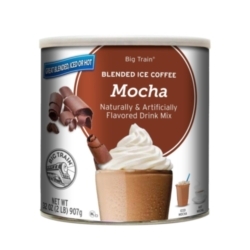 Available in decadent Mocha in a convenient resealable can (scoop included)! One case = 6 2lb. cans. $0.46 / oz. $0.44 / oz. $0.41 / oz. $0.38 / oz. Mix 2 scoops with 5 oz. chilled water, milk, or coffee. Add 12 oz. of ice & blend until smooth. Add 2 scoops to 7 oz. of hot water or coffee.